eHow is back in the news after claims it was hit hard by latest expansion of Google’s Panda update and subsequent denials from Demand Media. Articles like “How to Pour Water Into a Glass Cup” make it difficult to dispute eHow’s reputation as the poster child of content farms. But in terms of keyword targeting, how different is eHow from major news sites? 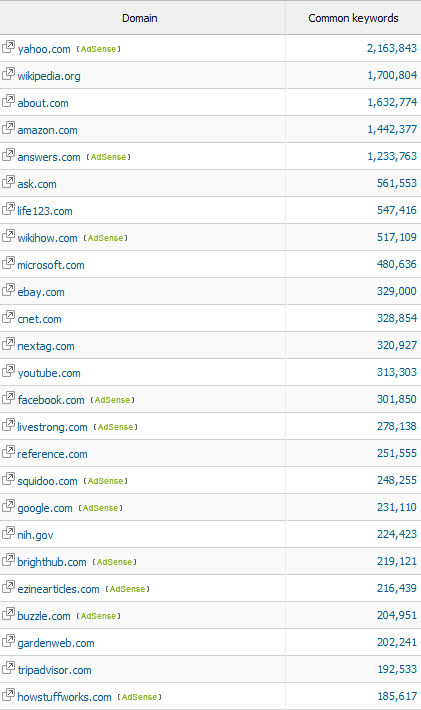 To get a rough idea I used SEMRush to look at the sites that have the most keywords in common with eHow. SEMRush’s “Competitors in Google” report ranks a site’s competitors by the number of keyword phrases for which both sites appear in Google’s organic search results. So at a very basic level the more common keywords two sites share, the more similar they are at least in terms of keyword targeting. I exported the first 10,000 results from SEMRush and went through the first few thousand looking for major news sites, primarily newspapers, national and local news organizations and online news sites. Then I added in a few major tech news sites to round out the list. The New York Times tops the list with more than 100K keywords in common with eHow. It was #46 on the overall list of competitors. It should be pointed out however that with over 10 million nytimes.com pages in Google’s index the keyword overlap represents only 1% of NYT content. USA Today and CNN also have considerably more common keywords than the other news sites on the list. 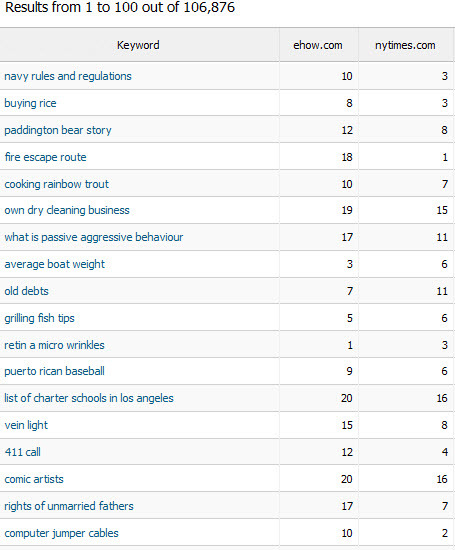 The top 10 all share 29K or more keyword phrases with eHow. What kinds of keywords do the news sites have in common with eHow? Kind of an odd mix, but I spot checked the terms and both sites do surface in my Google results. In looking at the shared keywords for several sites, the commonality stems from both evergreen content on the news sites and news content on more general topics. An important thing to point out however is that shared keywords do not necessarily mean shared quality. Just because some news sites are covering similar topics to eHow does not mean the quality of the content is the same. That said Google is surfacing both the news sites and eHow for related search queries. Which sites of any type share the most common keywords with eHow?